As Archivist, I’m sometimes asked to talk to organisations about the records that we have and what we do, and last week the Scottish Genealogical Society asked me to go along to give an evening lecture on birth records. Maternity records are often confused with birth certificates, but whereas the latter are statutory records, the registers and accounts of births that we hold are very much medical ones. Our earliest records of birth date from 1825, from the Edinburgh Lying-In Institution, and we have some maternity register entries that go right up to the early 1990s. 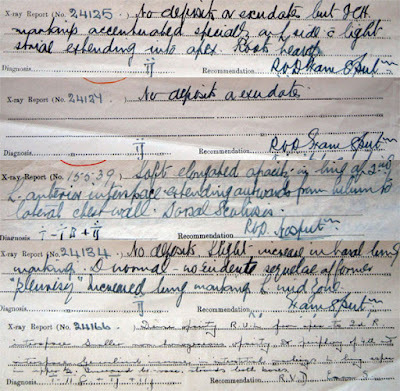 As opposed to birth certificates which give biographical detail on parent(s) and child, the records that we hold are created in the course of a mother’s treatment and care and give relatively scant biographical detail and (unless a particular factor affects pregnancy or postnatal care) do not record what happened to mothers prior to admission or to mothers and children after they left the hospital (although a forwarding address is sometimes given). 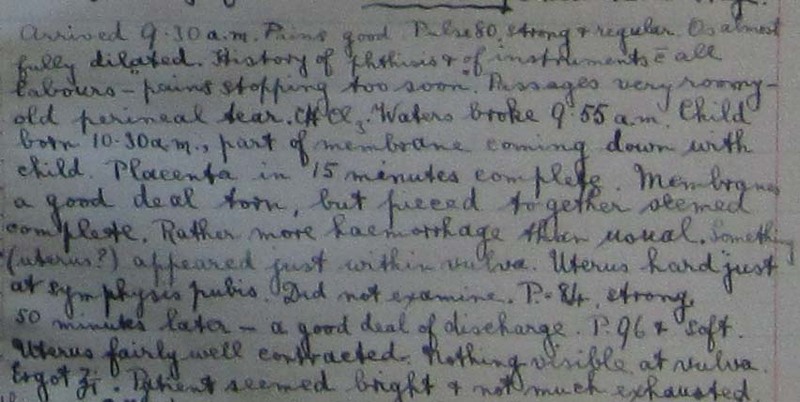 This is not to say that these records hold back, though, as this detailed description of a birth attended by nurses from Elsie Inglis’ Canongate Hospice shows! 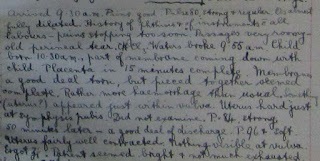 Excerpt from Records of Confinement, The Hospice, 1907 ( LHB8A/12/1). Nevertheless, birth records have much to offer genealogical researchers, in that they can reveal certain details that the ‘official’ record leaves out – one of our enquirers found out the name and address of a child’s father from one of our 1860s’ birth registers, for example, which was not recorded elsewhere. Genealogists usually contact us following the discovery that an ancestor was born in one of our region’s hospitals after looking at statutory records, usually via ScotlandsPeople. Until the mid-1920s, that hospital is invariably the Edinburgh Royal Maternity Hospital (ERMH), later the Simpson Memorial Maternity Pavilion (SMMP). For this institution, I’d normally find a birth recorded in a Register of Births (LHB3/14), which would tell me more about the parents of the child and their background, including their native place, the age of the mother, where the parents had originally come from and where they were going to after the birth. You’ll notice that, in the image below, there’s a column for the occupation of the mother if illegitimate, and the occupation of the father if the child was legitimate. This emphasis on legitimacy gives us a clue about the purpose of the hospital: the ERMH was originally founded in 1844 as a place where poor women could give birth in a medicalised environment. It started off in Nicolson Street, but by 1879 settled in a new building in Lauriston Place, becoming Edinburgh’s first purpose-built maternity hospital. The original rationale for the hospital meant that it treated women with few other places to go. The ‘Mother’s occupation’ column in these registers in and after this period is peppered with shop assistants, farm workers and domestic servants, for example – (usually) young working women with no option to give birth at home, as most other women did until the mid-1920s when hospital births grew in popularity in the city. The relatively high number of illegitimate births in the ERMH could also be explained by the close proximity of the Lauriston Home (later the Haig Ferguson Home), a home for unmarried women undergoing their first pregnancy, founded by Dr James Haig Ferguson in 1899. Although we have some administrative records from this home, no records of the pregnant women confined there have survived. The ERMH Registers of Births will tell you if a mother came from the home though, giving a clue as to her circumstances. If you’d like to read about one LHSA researcher’s discovery of the Lauriston Home’s role in her own ancestor’s past, you can read an excellent account here. With a bit of research into acronyms, you can see how the child was born and the health of mother and child after the birth. An interesting point for genealogists is that previous numbers of pregnancies were recorded – hinting whether there might be further ancestors to explore. The way in which this information was written varies through the years, but the type of detail remains very similar – even now, some people who have never known facts about their birth like to look at their own register entry to see how heavy and how long they were as a newborn, for example! Front page from SMMP Admissions (LHB3/12A/21). Key information about the length of pregnancy is symbolised by letters, and medical information about mother and child codified in a key with 82 possible numbers – used in SMMP recording of births from 1955. As I progress through to our more recent records of births, they become far more ‘medicalised’ and less obviously biographical and researchers might need some extra information or help to decipher them. Birth records differ from other patient records that we hold in their slightly more complicated access conditions. Since entries in birth registers hold information for at least two people (the mother and the child[ren], and sometimes a father), each separate individual represented there has information rights, either under the Data Protection Act (1998) if living or through NHS Scotland guidance on the health records of deceased patients. Because our closure periods on adults and children differ, researchers looking at birth records after 1915 would need to talk to me about how they can access information from them – and it may be that they can see certain details in a birth register, but not others. 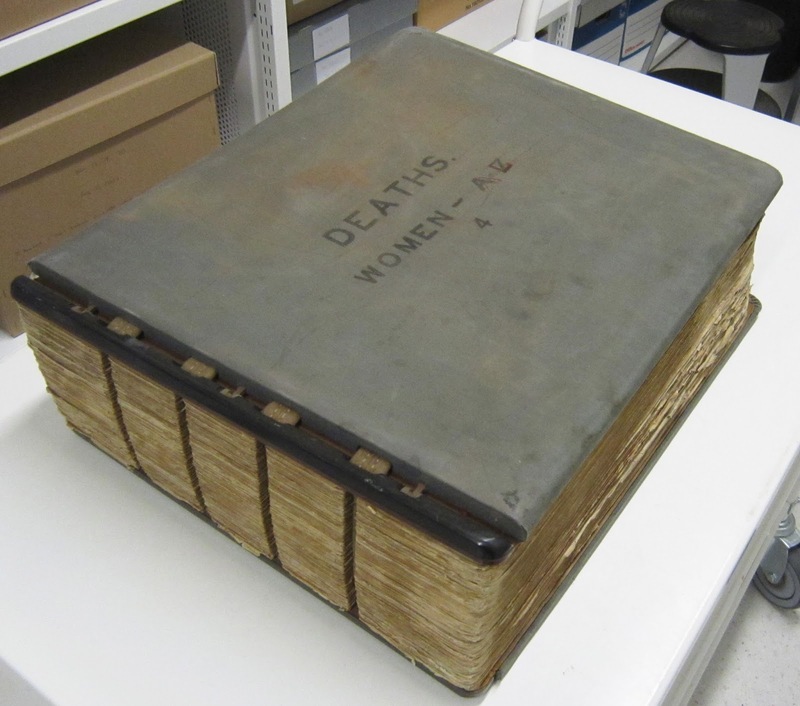 We also have birth notification registers, giving skeleton information on all births in the City of Edinburgh – although there are a few gaps, we have these registers covering dates from 1916 until 1962. After the Notification of Births (Extension) Act 1915, local authorities were required to record all registered births as part of a duty to care for pregnant women, mothers and children under five. 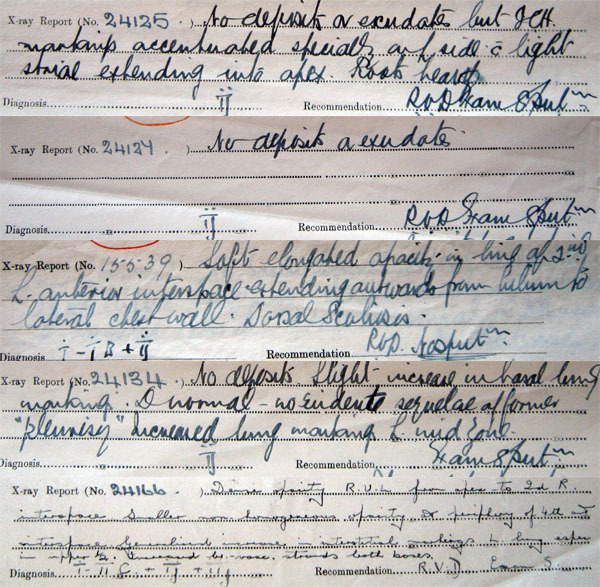 These registers also can tell us about other institutions that provided care for pregnant women (such as private nursing homes), but because of the lack of affiliation of most of these homes to what was to become the NHS in 1948 (meaning that they won’t be represented in our archive holdings), we cannot usually trace any further surviving records. I always enjoy talking to groups about LHSA. We do offer a remote enquiries service, too, though – so if you think you can use the birth records that we hold, please don’t hesitate to get in touch. Cataloguing case notes can be quite a challenging task when you don’t have a medical background. Although we are interpreting the records, and not diagnosing patients, it is still important for us to understand what we are reading so that we can record the important information in our catalogues. Firstly, doctors’ handwriting is notoriously difficult to read! Additionally, unfamiliar terms and abbreviations are often used (e.g. ‘syncope’ instead of ‘fainting’), medical terms for body parts are not always recognisable (my new knowledge from this project has won me many a point in a pub quiz), and some of the terms used are no longer in use. Fortunately, there are web resources that can help. A combination of palaeography skills and Google usually helps to make sense of tricky handwriting. Google is also great for finding out what unfamiliar terms mean, as well as unexpectedly showing gruesome pictures of some medical conditions; my search history paints a worrying picture. We also use MeSH (Medical Subject Headings), a hierarchically organised index of medical terminology, to provide standardised terms – MeSH usually incorporates alternative and previous terms into its definitions, which is really useful. 1. This classification was used at Southfield Sanatorium. 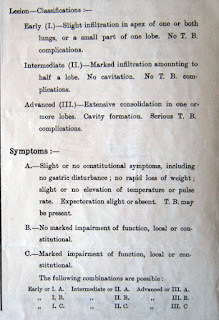 In his “Address in Medicine Delivered at the Seventy-Seventh Annual Meeting of the British Medical Association” in 1909, Sir Robert William Philip advocates a system of classification of tuberculosis which uses the symbol ‘L’ to represent the lung or local lesion, with three stages of severity. The symbol ‘S’, in upper or lower case, represents the extent of systemic involvement. 2. The next two symbols (actually the same symbol written in two ways), usually appear in place of the word “tuberculosis” in the sentences “No family history of tuberculosis” or “No PS [physical signs] of tuberculosis”, and is sometimes used to represent a diagnosis. 3. This classification was used at the Royal Victoria Dispensary, and has been a little trickier to work out. Based on what else is happening in the case notes in which it appears, where a patient has been subsequently hospitalised or a later letter refers to them as being diagnosed with tuberculosis, it definitely means tuberculosis, and it appears to have a similar grading scale as Philip’s classification above. 4. This is another version of the same classification scale, also used at RVD, and seems to show a diagnosis of a quiescent or less active case of tuberculosis. 5. This is the classification used at the Royal Victoria Hospital, which is helpfully explained on the back of the discharge summary (see below). Those were all relatively straightforward to work out, but these things are never too simple. The case notes from the Royal Victoria Dispensary also feature the symbols shown as a diagnosis in the examples below, which I have so far been unable to ascertain the meaning of. 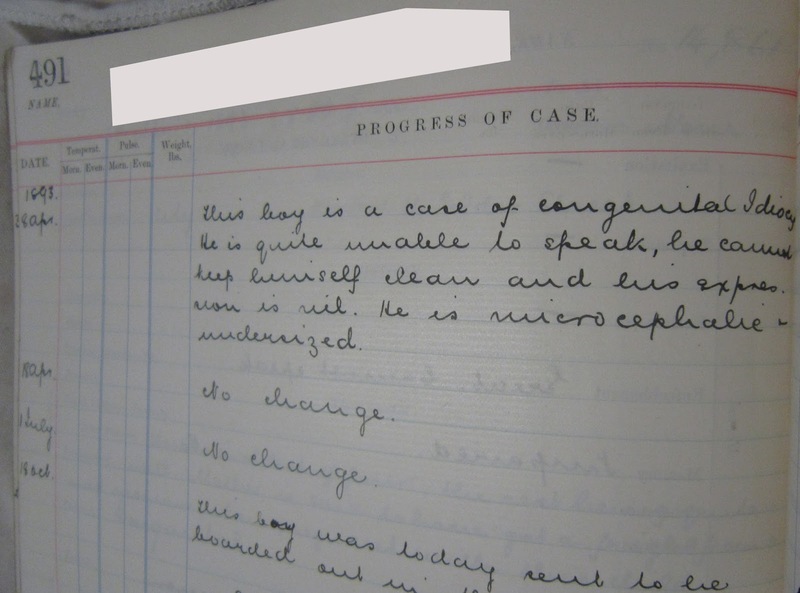 The case notes in which they appear lack the context which has helped in other cases, and there doesn’t seem to be much consistency across the case notes which would allow me to say with confidence that this means, for example, bronchitis, though it is almost definitely a lung thing. As the image shows, it sometimes appears alongside a TB diagnosis, so it probably isn’t tuberculosis. If you have any ideas what it might mean, I’d be really grateful to hear them! As you can see, a medical background is not necessary in order to catalogue the case notes, though some medical knowledge can really help when it comes to understanding them, particularly when they start using obscure terminology or symbols. Fortunately, we have the resources to deal with these challenges, which means that we can create useful catalogues to help unlock these fascinating records. A man of principle: a look into the life of Eric F. Dott. Today, I would like to expand on the life of Eric F. Dott, a conscientious objector during the First World War and a children’s physician at the Royal Hospital for Sick Children in Edinburgh. Under the project ‘Cataloguing Norman Dott’s neurosurgical case notes (1920-1960)’, much has been written about his brother Norman, the pioneering neurosurgeon from Edinburgh, but Eric was a no less remarkable man. Simultaneously a Christian, a pacifist and a socialist, this well-loved paediatrician stood up for his principles all his life. Eric Dott was born on the 3rd of December 1898 in the Dott’s family house in Colinton, at that time a small village five miles out of Edinburgh. He was a bright young man who discovered his Christian faith at an early age: when he was 11 year-old he was deeply moved by an organist practising in the church near his house, and from this moment he pushed his whole family to go to Church, thing that the Dotts weren't doing before. He stayed consistent with his Christian beliefs during one of the darkest and most proving times of the 20th century: the First World War. In 1917, when he was eighteen, he was called up to active service and sent to a place near Kinghorn, in Fife. However, at the first opportunity he disobeyed a direct order on moral grounds and thus was sent to the guardroom under arrest – he had become a conscientious objector. He was sent to Wormwood Scrubs camp, where he endured solitary reclusion and severe restrictions. After a bit less than four months, he was transferred to Dartmoor Prison to do some work of ‘national importance’: it mainly entailed digging holes or breaking stones, activities that Eric called ‘a farce’. However the living and working conditions in Dartmoor Prison weren't as gruelling as in Wormwood Scrubs, and prisoners had more liberty. Eric Dott spent a lot of time debating with other men of similar principles about religion, philosophy, and politics. At first he had opposed the war because of his Christian principles, and then he had become increasingly interested in the political aspect of the conflict, influenced by his father’s ideas about socialism. This ideology stayed important for him: when his father Peter McOmish Dott died in 1934, Eric was left to administer the considerable sum of money he had left in his will for the benefit of the Labour Movement and Socialism generally. Eric founded the Peter McOmish Dott Memorial Library, where books were purchased with a bearing on socialist education. A young Eric Dott soon after he joined the staff of Royal Hospital for Sick Children. 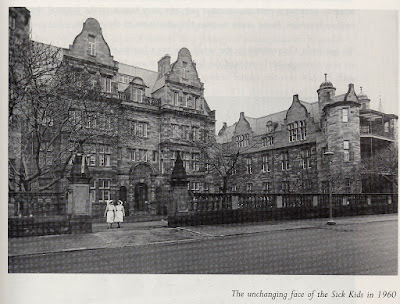 After his liberation, Eric enrolled at Edinburgh University to study medicine, and soon set up in practice as a doctor: by 1929 he had started up a small practice in Eltringham Gardens, off Rob’s Loan, in the west of Edinburgh, and by the mid-1930s he was working at the Royal Hospital for Sick Children. Records about him are somewhat lacking, however a few documents show what kind of doctor he was. His competence was recognised: in 1935 Eric Dott was appointed Honorary Assistant Physician to the hospital for five years, and in 1939 he was appointed ad interim as Physician of the Forteviot House. Eric also demonstrated his dedication and eagerness to help during the Second World War. Indeed, in a letter dating from 1939 addressed to Mr. Henry, the Honorary Secretary to the Hospital, he confirmed that he was absolutely ready to put his car and himself at the hospital’s disposal if the children needed to be evacuated. In another letter to Mr. Henry dating from December 1941, it is explained that Eric Dott had had to work both as a Ward Physician and as an Assistant Physician during one year because of a shortage of personnel: he gave a lot of himself during this difficult period. Photograph of the Royal Hospital for Sick Children, where Eric F. Dott worked as a paediatrician. I had the pleasure to have a chat with Professor Arnold Myers, who knew Eric Dott personally, to give a little personal touch to the portrait. Mr. Myers describes him as ‘a small man with nice features, very bright, alert and courteous’. He was a very keen chess player, and was very fond of his cat like his brother Norman was very fond of his dogs. Eric Dott spent his retirement in his quiet home of Canaan Lane, where he lived with his three sons, and died on the 8th of July 1999 in Edinburgh, aged 100. Rush, C., and Shaw, J. (1990) With Sharp Compassion, Aberdeen: Aberdeen University Press. Goodall, F. (2010) We Will Not Go to War: Conscientious Objection During the World Wars, Stroud: History Press. Conscientious objectors at Dartmoor Prison in England, c. 1917 [online]. Scottish Cultural Resources Access Network. Available from: http://www.scran.ac.uk/database/record.php?usi=000-000-463-616-C [Accessed 14/04/2016]. Photograph of conscientious objectors at Dartmoor in 1917. Eric Dott can be seen on the front row, fifth from the left, wearing glasses. Conscientious objection in Britain during the First World War [online]. Learn Space. Available from: http://www.ppu.org.uk/learn/infodocs/cos/st_co_wwone4.html [Accessed 14/04/2016]. Clements, K., Podcast 37: Conscientious Objection [online]. Imperial War Museums. Available from: http://www.iwm.org.uk/history/podcasts/voices-of-the-first-world-war/podcast-37-conscientious-objection [Accessed 14/04/2016]. Lothian health Services Archives, LHB5/36, Royal Edinburgh Hospital for Sick Children, 1859-1992. As Louise discussed in her recent post on closed records, there are a number of legal restrictions that we have to navigate when providing access to the records in our care, such as the Data Protection Act (1998) and NHS Scotland guidance on records of deceased individuals. Not every access concern is legislated though, and this week Alice explains some of the thinking behind our procedures. 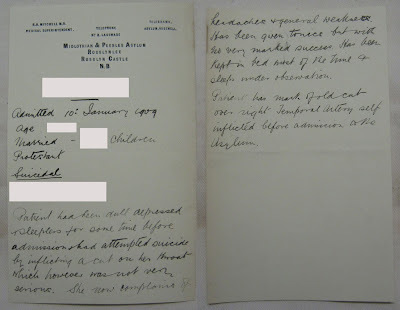 The 19th and early 20th century case notes and patient registers that LHSA hold are a valuable resource for family historians, and we often receive enquiries relating to a specific patient. Where possible, if we find information on an individual we always aim to send photos of any relevant records to the enquirer. It is our general practice to block out or redact identifying information about any other patients when providing these photos, and understandably, this can seem strange to some researchers. Why bother redacting information about someone who has long been dead? At a recent conference on the societal impact of records, I heard Dr Joanne Evans of Melbourne University, Australia, speak about how her feelings towards ‘open’ records have changed somewhat in recent years. The increased media coverage of historical abuses and the resulting inquiries has reminded us all that ‘records subjects’ are much, much more than this epithet suggests. The passing of time – say, 100 years - between a record being created and that same record becoming ‘open’ can easily lead us to disconnect the items we deal with from the lives they represent, but as these issues have highlighted, these items weren’t created in a vacuum. Although the subject of a record may have passed away a long time ago, the records themselves can represent a part of that person’s life, and – to some extent – live on as an avatar for them. Another talk at the conference brought this even closer to home. In his discussion on the impact of the Public Records (Scotland) Act of 2011, Dr Hugh Hagan of the NRS noted that records made by and about us throughout our lives help us to answer the question of “how do you know who you are?”, in that they allow us to identify and describe ourselves and our relationships to others. With that in mind, it is important that we are mindful of how we as archivists treat such records. Dr Hagan recounted how one victim told the Shaw Inquiry on historical abuse that he had struggled to obtain records about his time in care, and when he did receive them, they were incomplete or had been so poorly managed that crucial contextual information was lost. He remarked to the Shaw inquiry that he felt the lack of respect the records had been shown reflected the lack of respect he had been shown as a young person in care. 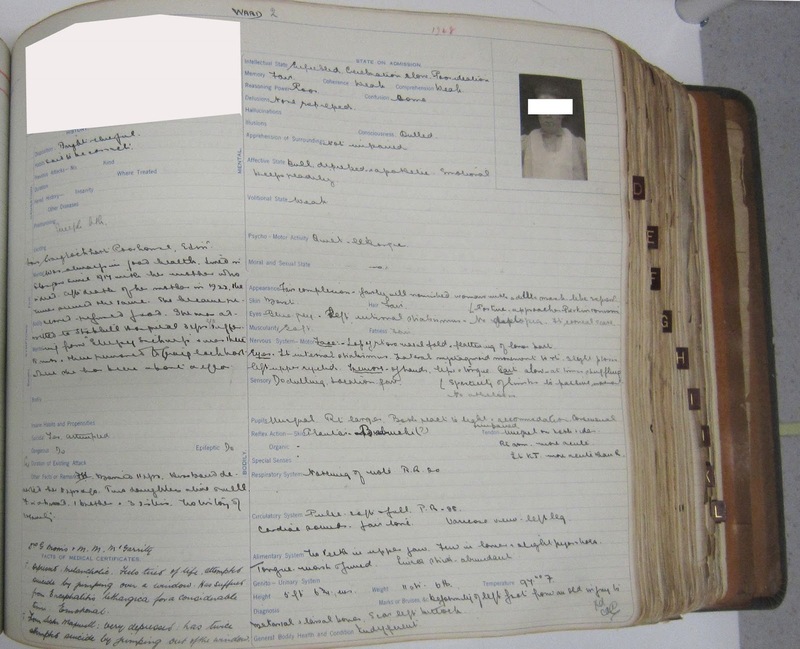 As the repository for historically important local records of NHS hospitals, LHSA exists almost as a branch of NHS Lothian, and we therefore need to consider how our treatment of and attitudes towards patient records reflects on them. Another factor that has to be considered is how much language – and particularly language around mental health – has changed since some of the records were first created. It’s not uncommon to find a 19th century patient described as “a profound idiot” or “dull and stupid”, or to hear fantastical and salacious accounts of how insanity manifested itself and what had instigated a patients admission to an asylum. While we can certainly glean a lot from such accounts – not least an understanding of how our attitudes have changed – it is vital we remember that these records are not created, kept, preserved and made available for our entertainment. They contain and reflect people’s lives, and we must never lose sight of the person in our search for the information. Over the last few months LHSA staff have been extending our work to help improve the environment in hospital for patients, staff and visitors. 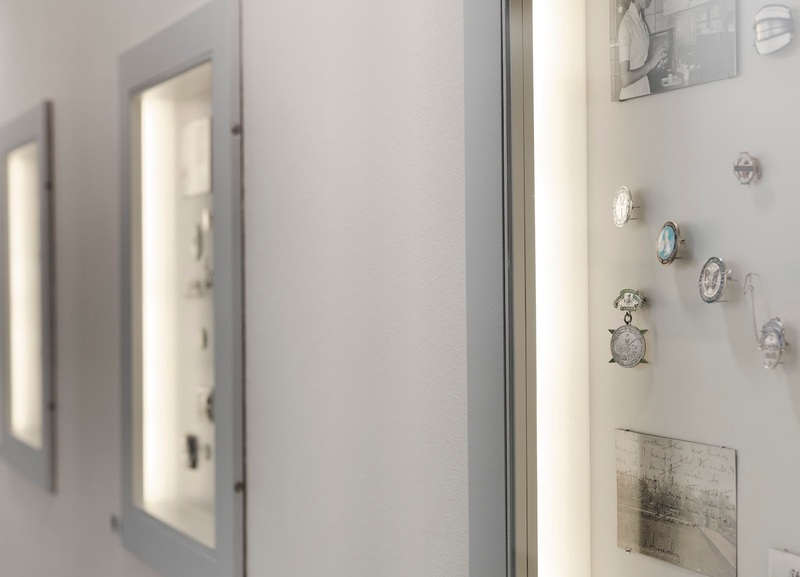 We’ve had some experience of this in the past, with LHSA collections being used as ideas for (and integral parts of) art installations in the Royal Infirmary. A great example of this is the ‘Unsung Heroes’ project where historic nursing badges were paired with modern jewellery made by staff and students at Edinburgh College of Art. We're now involved in a major project called ‘Old to New’, which will create artwork based on the history of the Department of Clinical Neurosciences and the Royal Hospital for Sick Children for their new home on the Little France Infirmary site. We’ve already provided support to a researcher using the collections to draw out stories to be illustrated in the contemporary pieces that will be commissioned soon, and recently produced additional resources for artistic inspiration in the form of oral histories (we had a great time recording the experiences of a group of nurses who had trained at the Sick Kids in the 1950s). ...and watch this space to see how LHSA collections continue to contribute to the ‘Old to New’ artwork!